I got these in a goody bag from Ms. NLi10 a good while ago and they have been sitting on the snack shelf ever since. As a result of the sugary blood pack leaking onto said shelf I've had to tidy up a bit and took a load of things to work. One of those that I thought would see more action in a group environment was this pack. 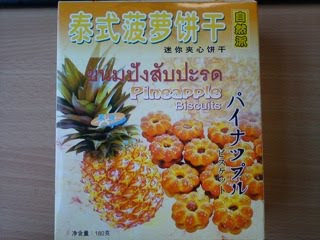 From it we know two things - it's Pineapple and it's Biscuits. I'm not keen on artificial fruit flavours, they mostly go wrong, and China isn't well known for getting the authentic western biscuit flavour right. These even sat around at work for a bit before someone pointed out that they looked like yellow Jammie Dodgers. As I really like Jammie Dodgers the pack was opened in seconds. Inside I found two trays and that the biscuits were much smaller than pictured. On first bite there is much sweetness, and the taste of the biscuit is a strange one. 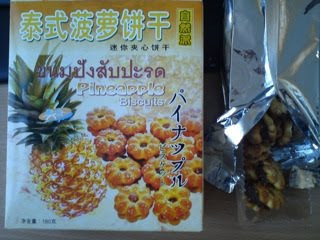 It's almost like a crispy savoury biscuit, with sesame seeds on the outside. Balanced by the nice sweet flavour (that only tastes like Pineapple because you were already thinking about them) these are quite moreish and demand to be consumed in 2s or 3s. Perfect for sharing, the first tray was gone within the day! As a repeat proposition these are nice to share and sample, but they aren't really one that you'd buy to eat through entire packets like the normal Jammie Dodgers. It was certainly a nice surprise to find out that these were not only edible but rather exciting too.